Set with a brilliant, round cut 1/3ct diamond solitaire in an elegant four claw setting, this beautiful polished 18ct White Gold ring is certain to be treasured. Celebrate your engagement with a one-of-a-kind ring by The Diamond Story, Certificated by GSI. 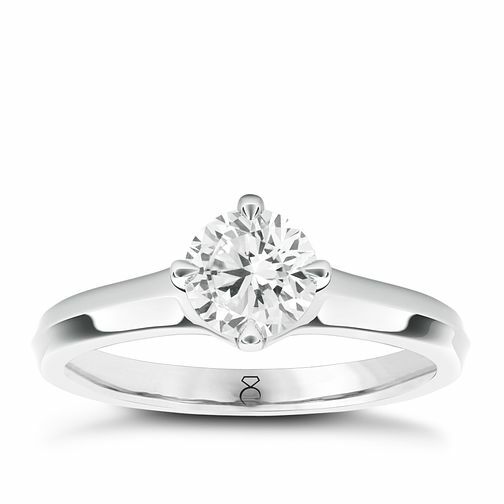 The Diamond Story 18ct White Gold 1/3ct diamond ring is rated 4.6 out of 5 by 7. Rated 5 out of 5 by Anonymous from Beautiful Ring my fiancé got for our engagement I got this ring over two years ago when proposed to. I absolutely love the ring. It sparkles lovely and is so dainty. The diamond is stunning and comes with a lovely story and packaging. I got married last year and got the ring redipped before my wedding. With it being white gold I think it is common for the white gold to fade in time - especially when wearing every day. I took it back to Ernest Jones and their customer service was fantastic and the redip was not expensive in the grand scheme of things as the ring came back and looked fantastic. Overall I would recommend this ring to anyone. Rated 2 out of 5 by Anonymous from Beautiful to begin with This ring was beautiful for the first 8 months then the white gold started to rub off, returned to ring to be told this happens, and the ring would need to be redipped every 6 to 18months. When purchasing the ring this was not stated other wise the ring wouldnt have been purchased.